DETROIT -- Chrysler's second-largest unsecured creditor is BBDO, Detroit, which is on the hook for $58.1 million, according to the automaker's bankruptcy filing. The news comes as the agency readies an ad campaign that will break on Sunday to explain to the American public that despite the bankruptcy, Chrysler is still in business. BBDO's parent Omnicom has been tightening its sequential-liability clauses in media contracts since last summer, and this case could test how well they hold up in court. Although that seems to indicate BBDO's parent, Omnicom Group, also stands to take the hit, it's believed the bulk of that money is owed not to the agency but to the media it bought on Chrysler's behalf. The majority of that is believed to be owed to local TV stations, as Chrysler moved from national buys to spot earlier this year, according to three executives close to the matter. The government has created a special pot it will fund to support so-called "critical vendors." The court will decide whether BBDO qualifies as one. If that status is granted, the agency would collect about a third of the $58.1 million it is owed and use its sequential-liability claim for the rest during the time Chrysler is in bankruptcy, one of the executives said. Neither BBDO nor its holding company, Omnicom Group, would comment. Omnicom has been tightening its sequential-liability clauses in media contracts since last summer, and this case could test how well they hold up in court. Some media outlets have asked Chrysler for cash upfront before doing deals, a Chrysler spokeswoman said, adding that she did not know which companies had done so. The Chrysler bankruptcy in fact, is "much worse for the media companies than for Omnicom," said Jason Helfstein, an analyst covering Omnicom at Oppenheimer & Co. In an earnings call with analysts this week, Randall Weisenburger, Omnicom's chief financial officer, said, "I think we're very well positioned overall. If the scenario is Chrysler goes into a reorganization and they or their brands continue in business ... I think our exposure is extremely limited, maybe really to the point of zero." He added, "If it were to go -- take an extreme scenario the other way, which I think is remote, maybe even impossible, which would be the brands went away and we had a complete shutdown of the office. I think our cash exposure is probably $25 to $30, $35 million. There may be some additional charges, write-off of furniture and fixtures and some things like that. But that, I think, is an extremely unlikely set of events." An Omnicom spokeswoman said in a prepared statement, "It is obviously early in the reorganization process, and we continue to work closely with our client. As far as the potential balance-sheet impact to Omnicom, we stand by our statements made on the April 27 earnings call." David Heiman, a bankruptcy attorney for Chrysler at Jones Day, said he's not allowed to discuss whether Chrysler or the administration's auto task force was trying to negotiate with BBDO to lower the amount the carmaker owed the agency before the filing. He declined to comment at all on the case. Omnicom's spokeswoman and a BBDO representative both said they do not know whether there were talks to lower the amount Chrysler owned the ad agency. Both declined to comment further. Investors in BBDO's parent, Omnicom Group, appear not to be spooked by the filing. The holding company's stock slid by only a penny to $31.46 per share at yesterday's market close. Chrysler, meanwhile, will kick off an educational ad campaign from BBDO next week, probably in newspapers, to explain that the carmaker is still in the business of selling and servicing cars and trucks, said an executive close to the matter. That blitz will be followed by ads, also from BBDO, that combine a corporate and product message. "Companies in this kind of situation need to communicate more rather than less," a Chrysler spokeswoman said. The spokeswoman said Chrysler will run ads in newspapers in the top 50 U.S. cities on Sunday and in The Wall Street Journal, The New York Times and USA Today on Monday. She said she doesn't know what the specific messaging will be, but the ads are designed "to help consumers understand that we are restructuring into a stronger, leaner company, and that we are still in business with dealers, who are still selling and servicing cars." Oppenheimer's Helfstein predicted Chrysler will "absolutely slow down in media spending" now that the company is reorganizing in Chapter 11. Chrysler spent $707 million in U.S. measured media in 2008, or 35 percent less than in 2007, according to TNS Media Intelligence. 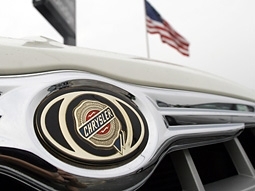 Chrysler shifted to spot TV from national buys early this year. President Barack Obama called Chrysler's filing "not a sign of weakness but a step to Chrysler's revival." He urged Americans who are mulling a new-vehicle purchase to "buy an American car." Chrysler said in a release the government will provide sufficient debtor-in-possession financing during the bankruptcy to allow continuation of "business as usual." The company said it will "seamlessly honor warranty claims, pay suppliers and keep our dealer body operating to continue to serve our valued customers."